1. Fill your fridge with three-step, one-pan gourmet Gobble meals that are already divided into perfect portions. What does it include? Your weekly delivery will include a total of three dinner kits, each with two or four meals. Where is it delivered? Gobble ships to California, Nevada, Washington, Oregon, Arizona, Idaho, and Utah. How much does it cost? You will be charged $11.95 per meal, if you order six or more meals, and $13.95 per meal, if you only order four meals. 2. 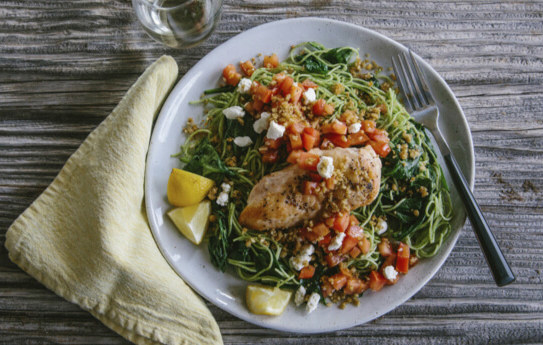 Choose Hello Fresh for the option of 10 easy-to-make recipes you can pick from as you plan out your meals for the week. What does it include? Your delivery will include insulating liners, ice packs, and cooling materials to keep your food as cool as possible. Where is it delivered? Hello Fresh ships across the continental United States. How much does it cost? Plans start at $8.74, with the option of a Classic, Veggie, or Family Plan. 3. Live out your executive chef dreams with a Martha & Marley Spoon subscription that sends all you need to cook the recipes you choose from the Martha Stewart archives. What does it include? Your order includes pre-portioned ingredients and recipe cards. All of the ingredients are sorted by recipe in dish bags. Where is it delivered? Martha & Marley Spoon ships across the continental United States. How much does it cost? Plans start at $18, with a first-time voucher. The cost will possibly increase, depending on the number of meals you need for the week. 4. Pick the exact meals you want each week with Home Chef, which offers 11 options personalized to fit your taste profile. What does it include? Your package includes the ingredients to make your meals and detailed visual recipe cards. Where is it delivered? Home Chef delivers across the continental United States. How much does it cost? All meals are priced at $9.95 per serving and featured premium dishes are sold at market price. 5. Bring an organic touch to your baked treats with some tasty FoodStirs recipes. What does it include? Your kit includes everything needed to bake and decorate the treats, except for perishable ingredients, such as milk and eggs. The kit also includes a recipe card with the nutritional value of all included products and a baking guide. Where is it delivered? FoodStirs ships across the continental United States. How much does it cost? You can subscribe to a one-, three-, six-, or 12-kit subscription, starting at $13.09. You can also buy the individual baking kits for $12.99+. 6. Spend quality time with your family preparing delectable dishes with Blue Apron, which partners with farmers to provide the fresh ingredients for your meals. What does it include? Your delivery includes pre-portioned ingredients and a detailed recipe card. Where is it delivered? Blue Apron ships across the continental United States. How much does it cost? The two-person plan starts at $59.94, and the family plan starts at $71.92. 7. Get all the gluten-free goodness by tapping into the Freshly menu packed with over 30 fully-prepared meals you can choose from each week. What does it include? Your delivery will include your pre-cooked meals and heating instructions. Where is it delivered? Hello Fresh ships across the continental United States. You can view a full list of locations here. How much does it cost? Plans start $49.99 per week. 8. Take a grab at Plated for a rotating menu of 15 amazing dinners — and even desert options – you can combine to fit the size of any meal plan you choose. What does it include? Your box includes the ingredients you need to make your meal, as well as speciality spices, if they are needed. The ingredients are individually wrapped and pre-portioned. And a recipe card is also included. How much does it cost? Plans start at $59.70 per week, with the option to choose from two-, three-, and four-serving options. 9. Stick to your healthy-eating goals with Veestro, a service that features plant-based meals made from organic ingredients. What does it include? Your delivery contains a clear set of instructions for preparation. How much does it cost? You can order meals a la carte for $10 per meal or meal packs starting at $8 per meal. You can also order weight-loss plan meals or a juice cleanse pack. 10. Make your blender a kitchen superstar with refreshing recipes from GreenBlender. What does it include? Each week you’ll receive five new smoothie recipes and all the pre-portioned ingredients you'll need to make 10 smoothies. Where is it delivered? GreenBlender ships across the continental United States. How much does it cost? You can order a week-to-week subscription for $49 or a monthly subscription for $176. 11. Put your Paleo plans at the top of your priority list with Pete’s Paleo, which delivers fresh Paleo meals straight to your door. What does it include? Your delivery will include meals placed in BPA-free plastic bags and vacuum-sealed for freshness. Where is it delivered? Pete’s Paleo ships across the continental United States. How much does it cost? Plans start at $115.62 for a five-meal subscription. 12. Completely revamp your eating habits with the delicious plant-based recipes from The Purple Carrot. What does it include? Your box includes recipe instructions and all the pre-portioned, fresh ingredients needed to make your meal. Where is it delivered? The Purple Carrot ships across the continental United States. How much does it cost? The one to two person plan costs $68 per week and the three to four person plan costs $74 per week. 13. 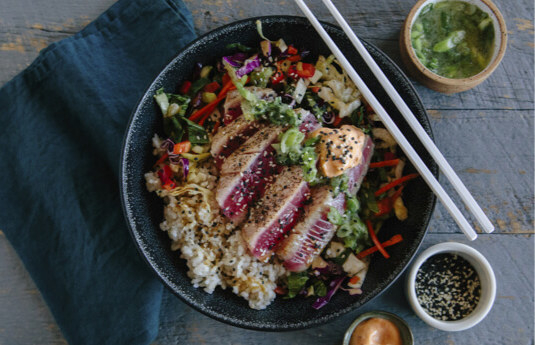 Prepare to put your stove into overdrive with tasty Chef’d meal plans crafted by well known health and food brands like the American Diabetes Association and Atkins. What does it include? Your delivery comes with the ingredients needed to make your meal and step-by-step recipe instructions. Where is it delivered? Chef’d ships across the continental United States. How much does it cost? Plans are priced according to the type of meals you choose. You can also purchase individual meals starting at $9. 14. 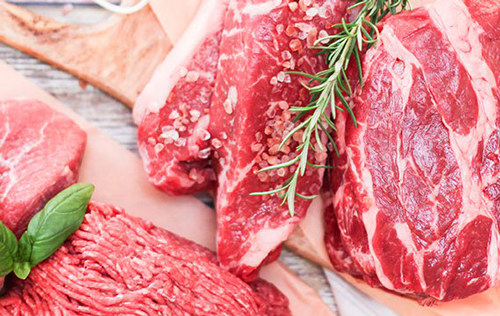 Stack your family’s plates each month with 100% grass-fed beef from ButcherBox, which also delivers pasture-raised chicken and pork. What does it include? 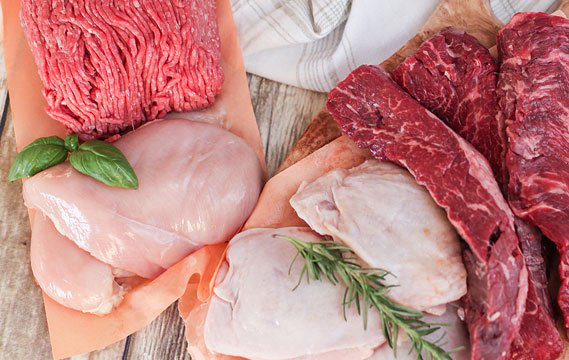 Your box contains a hand-picked and hand-cut selection of meats that can make 21-25 individual meals. Where is it delivered? Butcher Box ships across the continental United States. How much does it cost? Each box costs $129. 15. Cook up an amazing meal for two or a family of four in just 30 minutes with Green Chef — including Paleo, vegan, vegetarian, and gluten-free meal plans. What does it include? Your delivery contains fresh, pre-measured ingredients and simple recipe cards, with many of the ingredients already prepped for you. Where is it delivered? Green Chef ships across the continental United States. How much does it cost? Plans start at $10.49 per meal, with the cost varying on the plan you choose and serving size of the meal. 16. Chop it up with Crateful to personalize your eating experience down to the theme of your meal plan and the days you want your food delivered. What does it include? Your meals are delivered to your door ready to be eaten. They are stored in an insulated cooler bag with ice packs inside to ensure the freshness of the products for up to 24 hours. Where is it delivered? Crateful ships across the continental United States. How much does it cost? Plans start at $235, with the price changing based on how many days of meals you need and any dietary restrictions you may have. 17. Enjoy protein-packed meals that are under 800 calories with Real Eats, which you can prepare with only a pot of boiling water. What does it include? Your order will arrive vacuum-sealed in food-safe, recyclable pouches that you can heat up in a pot of boiling water. Where is it delivered? Real Eats ships across the continental United States. How much does it cost? Plans start at $45 per week, depending on the amount of meals you need. 18. Spoil your pup with fresh The Farmers Dog meals customized by vets for a dining experience made for pup royalty. What does it include? Your delivery includes human-grade, pre-portioned meals crafted for your dog by vets and based on criteria like age, weight, and genetics. Where is it delivered? Fill out The Farmer’s Dog questionnaire here to determine if they deliver to your home. How much does it cost? Pricing for plans is based on your answers to the questionnaire, which considers factors specific to your dog, like age, weight, and activity level. What does it include? Your kit includes pre-measured dry goods, herbs and spices, produce, and your proteins. They also include a menu card with the nutritional information of the dish and photos of the recipe. Where is it delivered? PeachDish ships across the continental United States. How much does it cost? Seeing that you can choose your own meals from the menu list, PeachDish only requires a minimum cart total of $45 for any individual shipment. 20. Let healthy food options take over your plates with the organic and non-GMO ingredients found in Sun Basket meals. What does it include? Your delivery includes seasonal ingredients that are labeled, so you know where your food came from. You’ll also receive recipe cards. Where is it delivered? Sun Basket ships across the continental United States, except for Arkansas, Montana, and parts of New Mexico. How much does it cost? The classic menu plan costs $68.94 per week, and the Family Menu plan costs $79.92 per week. 21. And spice up your life — and your weekly meal deliveries — with a subscription to Raw Spice Bar. What does it include? Each month, you’ll receive three spice pouches, with enough ingredients to create three individual dishes that serve four to six people. Where is it delivered? Spice Bar ships across the continental United States. How much does it cost? A monthly subscription starts at $8 per month.